Lock in a great price for The Wordsworth Hotel & Spa – rated 8.6 by recent guests! The room was clean, sheets clean, staff polite, scones & tea very good. Just great staff. All made us very welcome and happy. Vlad was great in the Bistro. Had a lot of fun there! lovely hotel right in the middle of the village, nice pool and gardens. it is the first time I have taken my dog with me, she was made very welcome. I liked the exterior of the premises and it's location was walking distance for hub of town. Excellent lounges/warm and welcoming reception area/courteous and friendly staff/no problems with parking/very central location/very good meals at breakfast and dinner. The comfort, the friendliness of staff, the relaxed atmosphere. The Wordsworth Hotel & Spa This rating is a reflection of how the property compares to the industry standard when it comes to price, facilities and services available. It's based on a self-evaluation by the property. Use this rating to help choose your stay! 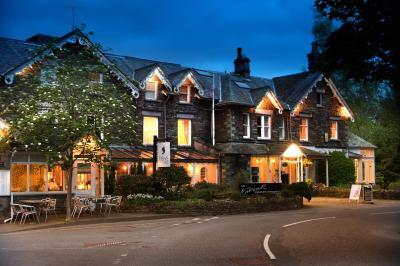 In the heart of Grasmere and surrounded by the towering mountains of the Lake District, the historic 4-star Wordsworth Hotel is set in riverside gardens and has an award-winning restaurant. It features a spa, indoor pool, a sauna and Jacuzzi. The fine-dining, air-conditioned Signature Restaurant offers an award-winning menu, while the informal Dove Bistro showcases high-quality local ingredients cooked with flair and skill. Each individually styled room has a blend of traditional and contemporary design. There are Egyptian cotton bed sheets and free WiFi for guests to use. Rooms also have a flat-screen TV, and tea and coffee-making facilities. Most offer stunning mountain or village views. The property offers a range of therapeutic and beauty treatments using products from the holistic, vegan spa brand Ytsara, and Jessica Geleration nail products. With wonderful views across Grasmere village and the surrounding fells, The Wordsworth Hotel is a 10-minute walk from the Wordsworth Museum and St Oswald’s Church. There is free private parking on site. Guests can enjoy relaxing treatments at Wordsworth's Organic Spa. 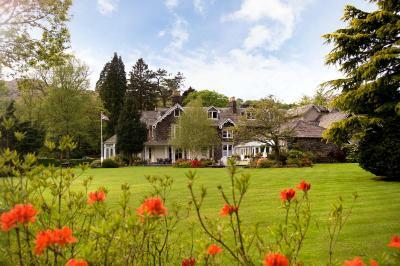 When would you like to stay at The Wordsworth Hotel & Spa? Classic Rooms have all the facilities of a Courtyard Double and are at the side of the hotel. These rooms with attached bathroom have Egyptian linen, flat-screen TV, Wi-Fi and mineral water. These larger, beautifully furnished rooms have views across Grasmere village. These rooms with attached bathroom have Egyptian linen, flat-screen TV, Wi-Fi and mineral water. Please request a double, twin or 4-poster bedroom at the time of booking. Room choice cannot be guaranteed. These large, rooms with attached bathroom offer the best views of the gardens or the mountains. All rooms have Egyptian cotton linen, bathrobes, a flat-screen TV, Wi-Fi and complimentary mineral water. Spacious room with lounge area, flat-screen TV, iPod docking station, Villeroy and Bosch bathroom, complimentary bathrobes and slippers and beautiful views of the gardens and mountains. Standard Courtyard rooms have Egyptian linen, private bathrooms, flat screen TV, wifi, hairdryer & telephone, complimentary tea tray & mineral water. These rooms do not have views. This boutique suite features an en suite Villeroy and Bosch bathroom as well as 2 flat-screen TV's and a remote control blind. Also includes complimentary Grasmere Gingerbread on arrival. This room features free WiFi and tea/coffee making facilities. These rooms do not have a view. This room can be arranged as a king or a twin room, please specify bed preference at the time of booking. This room offers an inclusive New Year's 3-Night Package. This room offers an inclusive New Year's 2-Night Package. House Rules The Wordsworth Hotel & Spa takes special requests – add in the next step! The Wordsworth Hotel &amp; Spa accepts these cards and reserves the right to temporarily hold an amount prior to arrival. The Wordsworth Hotel & Spa accepts these cards and reserves the right to temporarily hold an amount prior to arrival. Please note that there will be scaffolding around the building until 13 May 2019 due to maintenance work on the roof. Views from the Village View and Classic Rooms will be affected. Please book spa treatments well in advance to avoid disappointment. Please note Dinner Bed and Breakfast inclusive packages are 2 course dinner in the Signature Restaurant. We previously stayed in this room and again it is so very warm even with the fan provided , We adore this hotel so I think next visit I will request another room. Wonderful staff , Excellent facilities and location. Room decor a little tired and worn. Would benefit from redecorating. Located centrally in Grasmere. Bistro dining next door. Beautiful Egyptian cotton bed linen and towels. V comfortable king size bed. Light and airy room. We had one of the suites. Breakfast very good. Attentive staff. Pool and sauna good and welcome after a long day of walking. the room was a little small, the hotel is a little tired but think that was reflected in the price as all other hotels in the area with a pool were so much more expensive. Comfortable. Good food. Friendly staff. Our room did not live up to our expectations.Last time we were there we had a lovely room.The staff were attentive but most of them never smiled. The spa facilities were clean enough but lacking and pretty basic, especially for a hotel that includes “spa” in its name. The location was great and super convenient, with lots of lovely lounges to relax in and have a drink. Staff were really nice and welcoming. Lovely hotel and staff. Gardens and location beautiful. Would revisit. I had booked the weekend for a relaxing weekend for my partner. Unfortunately the pool area on Saturday and Sunday had been taken over by kids where the parents had left them to their own devices! Which led to the kids dive bombing in the pool and throwing each other in the water. Happy for kids to kids to be kids, just not in a hotel thats costing £200+ to have a nice relaxing time! Go to the local swimming baths not Wordsworth Hotel! Really annoyed me to be honest and a damp squid on an otherwise lovely stay. CCTV is supposed to monitor the pool area, the staff needed to have intervened. Where was the parents?? Staff really friendly. Excellent food and accomodation. Great location for Grasmere with nearby shops and cafes. Some rooms have been nicely modernised and some not and as we had one of each the differences were obvious. Great traditional hotel in perfect location.